Item is a photograph of Gayle Garlock, collections librarian; Dr. Friederich W. Gaede, chairman of the German department; Dr. Philipp Schmidt-Schlegel, consul-general for Germany; and Dr. Donald Betts, Dean of Arts and Science at Dalhousie University. 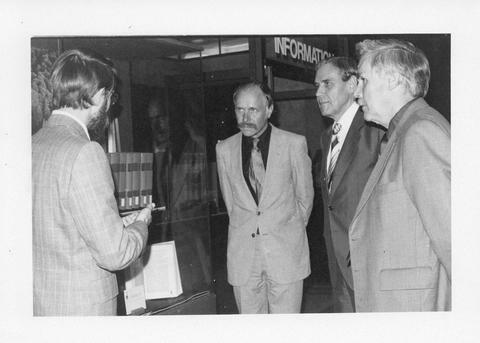 The four men are looking at an exhibit of encyclopedias given to Dalhousie by the German government. The photograph was published in University News, Volume 11, No. 4. Item is accompanied by a proof of the photograph and a caption from University News. A note on the back of the photograph reads: "Gayle Garlock; Dr. Friederick W. Gaede; Dr. Philipp Schmidt-Schlegel; & Dr. Donald Betts discuss exhibit of German books donated to Dalhousie by German gov't. Sept /80"